It's finally happening. Some of the biggest names in fashion and traditional watchmaking have decided now is the time to embrace smartwatches and hybrid smartwatches. Crucially, that's also led to an increase in connected options for women, something that's been one of our biggest criticisms of the smartwatch industry here at Wareable. And we're not just talking blingtastic, diamond encrusted watches. Although, we still have a few more of those thanks largely to Guess. Designers like Marc Jacobs, DKNY, Kate Spade and Tory Burch now have connected watches that retain the label's personality. It finally feels like there are options available that are not only slimmer and smaller, but also really show that some thought has gone into the smartwatch features that should be included. The rise of the hybrid has definitely played its part here. From Fossil to Swiss watchmakers like Frederique Constant, which had one of the biggest collections on show at the Baselworld watch show in March. Its Notify watch and sub-brand Alpina's Comtesse watches pack the smarts into a 34mm watch case making it one of the sleekest hybrids you can wrap around your wrist. Aletta Stas, Frederique Constant's co-founder, shed some light on why it has chosen to make a very concerted push to make more smartwatches for women. "If you consider buying a smartwatch like the Apple Watch, there are certain ladies who will buy it," she told us. 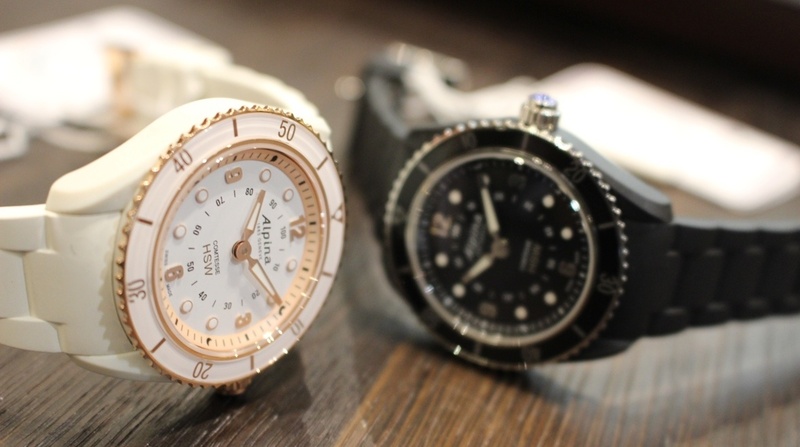 "Most women who are not in the watch industry, don't like the extra tech. They appreciate the mechanics less. Men love it. It doesn't mean every woman is like that, but the overall trend means the ladies are less interested in the technical." Swedish startup Kronaby also decided to make its first hybrid collection more female-friendly including a 38mm model that embraces traditional watch features offering some familiar smartwatch features and new modes like a Walk Me Home mode that lets users assign one of the watch buttons to alert contacts of your location so they can make sure you get home safely. I asked Kronaby if it was more difficult to pack the smartwatch features into a smaller body and the response was emphatic, "No, it's not. Both watches have the same technical specs, apps and features. It's all about how you make the system architecture work." For Frederique Constant, it has a different take on integrating those features into a more compact, wearable design. "When you make something small it's more difficult especially in mechanical movements," Stas explained. "We know the challenges and for the Horological Smartwatch we have less space for the PCB and sensor. But it's possible. For quartz it's much easier than mechanics." These lingering technical challenges clearly pose a problem, though, when you start talking about 'proper' smartwatches i.e ones with screens. Guess launched its first Android Wear smartwatches alongside its luxury brand Gc, which also offered mens (44mm) and women's (41mm) models with a big emphasis on keeping the design fashionable and going big on customisation. When we spoke to Guess they told us that the decision to strip out features like LTE connectivity, NFC, GPS and heart rate sensors was for one reason only; to make the smallest watch it possibly could. While I'm not sure I agree with the sweeping statement that women are less interested in the technology, getting that balance between features and design is still something that tech companies and watchmakers need to work at. The Apple Watch's appeal to women proves that the gender gap in who is buying them can't be attributed to women not being interested at all. Maybe the smaller, female-friendly Tag Heuer Connected Modular landing in October will get us closer to that perfect smartwatch for women. It's less likely that the delayed Swarovski Android Wear smartwatch will be it, this is probably cancelled. At the very least, I feel like I can now actually recommend a smartwatch to my female friends and family and that means things are moving in the right direction.